While most brides opt to stick to tradition by adding a delicate veil as part of their wedding ensemble, some choose to forego that in favor of a blooming flower crown. It's definitely eye-catching and a great way to make an impact for your walk down the aisle—and for wedding photos. If you want something more unexpected than the usual Coachella-esque crown, however, the ladies at fashion label Rodarte have figured it out for you. 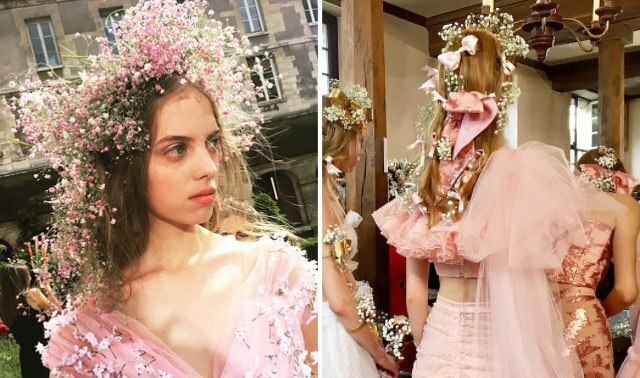 Behold, the ~dreamiest~ baby's breath floral wreaths seen at their Spring 2018 Couture show in Paris. We love how they imperfectly adorn the models' hair and how they complement the equally ethereal lace and tulle dresses. Take notes, CGs. We can imagine this becoming a huge bridal trend!